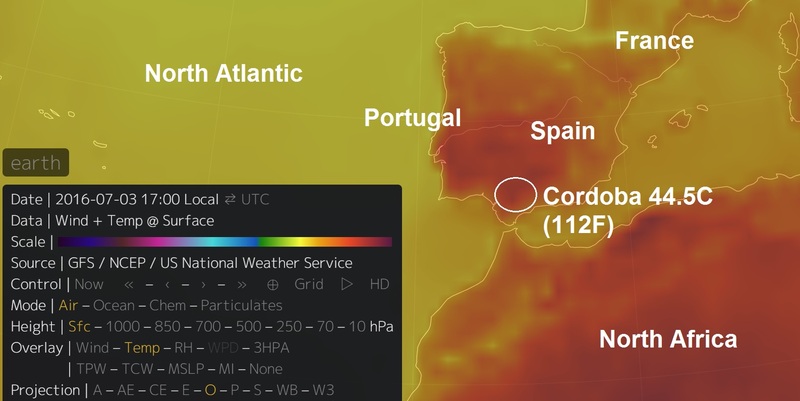 Extreme summer heat has set in across Spain, sending temperatures above 40 degrees Celsius. Heat warnings have been issued for much of the country. In the south, a red alert has been in place for the city of Cordoba over the last five days. Located in Andalusia province, Cordoba recorded a top temperature of 41C on Saturday, followed by 44.5C on Sunday. In truth, the city has the highest summer average daily temperatures in Europe, averaging 36.9C in July. Temperatures in excess of over 40C are by no means unusual in the summer months, yet, Sunday's maximum was still some eight degrees beyond the norm. Elsewhere, temperatures reached 42C in both Granada to the southeast, and Badajoz on the Portuguese border. In between them both, Seville recorded a high of 40C. The capital, Madrid, also recorded a maximum of 37C on Sunday, above the average June and July temperature of 27C and 31C respectively. Highs in Madrid have exceeded 33C every day since June 20. The searing heat has increased the risk of forest fires, with warning levels placed as "extreme" or even "high" in places. More thundery showers are expected across the Spanish Plain over the next few days, and although it will not be quite as hot, temperatures are still likely to reach the low 30s for much of this week.